The arrest of the Hizbul worker comes during Union minister Rajnath Singh's visit to Jammu and Kashmir. Srinagar: A man linked to terror group Hizbul Mujahideen was caught alive and two terrorists were killed during an encounter in Jammu and Kashmir's Kulgam district. The Central Reserve Police Force, Army and the state police -- which conducted the overnight operation in Khudwani area of Kulgam district -- said the arrest was made with a message that if misguided young men in the Valley wished to return to mainstream, they would be welcome. "He (Arif Ahmad Sofi) could have been killed by forces... But we preferred to give him chance to live and come to the mainstream. That's why caught him alive," said Kashmir police chief Muneer Khan. "It is a clear message to others who have been lured into all this that if they come, we receive them with open hearts". The police said Arif Ahmad was what they termed an "overground worker " linked to Hizbul Mujahideen. He provided logistical support to the group and helped with the recruitment in the area. Zulfikar Hassan, Inspector General of the CRPF, said he wished to assure every person in Kashmir valley that their future was safe "if you decide to get away from whoever is misguiding you". The arrest comes during the visit of Union home minister Rajnath Singh, who offered a roadmap of five Cs -- compassion, communication, co-existence, confidence-building and consistency - to end the unrest in the state. In his address to the nation on Independence Day, Prime Minister Narendra Modi had also remarked that Kashmiris need hugs, not bullets. Last year, the people in Kashmir suffered through five months of unrest after Hizbul terrorist Burhan Wani was killed. Around 60 people died and 250 were injured in the clashes that followed. 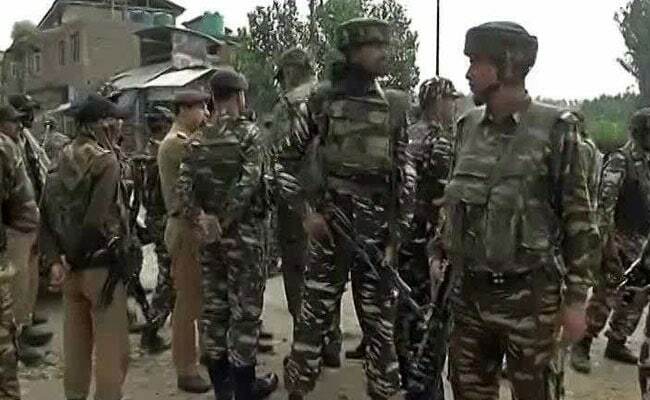 Sunday's encounter started after the security forces started a cordon and search operation following intelligence inputs about the presence of terrorists in the area. During searches, the terrorists had opened fire at the security forces who retaliated, leading to a gunfight.